Oh aye, there's treasure to be found out there in the sea. Riches that would make a beggar out of any monarch past or present. But for every tale you hear of a captain coming back to a bought title and a cushy retirement, there's a thousand more you don't hear of ships being devoured by sea monsters, or falling prey to the boiling waters. Had I known what lay beneath the waves when I was young deckhand seeking adventure… well, I hear farming is peaceful. No one is native to the sea and no one can live there permanently, yet it serves as an ever present backdrop, and battleground, for people and nations, great and small. It is not for nothing that the known world wraps around the Qeltan Sea. It is a source of food, a highway for trade and war, and if legends are to be believed a source of vast riches. They say it is easier to ship cargo and troops a thousand miles by boat than one mile by land. The coastal waters of the Qeltan Sea are warm with generally fairly mild weather. The coast line itself is quite rugged providing numerous small bays and lagoons wherein pirates and smugglers can hide. Because of this, despite fairly extensive naval patrols, both remain an issue. Even with the threat of piracy most trade routes primarily follow the coast as it’s safer than trying to cross the deeps. 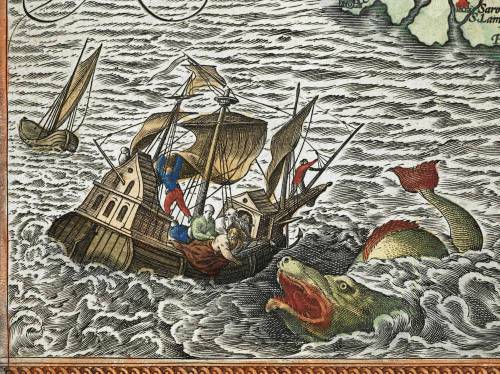 Larger sea monsters occasionally venture into the coastal waters but this is rare. However, all this changes as one moves out of sight of land. The deep waters of the Qeltan Sea are a mess of shifting currents, dangerous storms, floating reefs, boiling patches of ocean, and aggressive sea monsters. There are some safe (relatively speaking) routes that cross the entirety of the sea but these are closely guarded secrets by the merchants, pirates, and militaries that know of them. Safe routes are both spatial (go to here, then here, then here) and temporal (sail to this point, wait there for three days then continue on). These routes shift over time, and occasionally spontaneously collapse (or new ones spontaneously appear). New routes, if proven, are worth killing over. There are also persistent legends and modern rumours of mysterious disappearing islands. People claim to have found all matter of riches and magical artefacts in these places, but attempts to revisit them usually end up staring at open ocean. Still, there's enough people who claim to have seen them, and enough magic and treasure supposedly sourced from them, that it's difficult to dismiss the idea out of hand.